Thought Balloons - Creating Comics One Page At A Time: Why Starship Troopers? It's the human race fighting for its very survival against a horde of alien bugs. We're terribly outnumbered, outgunned, and outclassed. But we're not going down without a fight. It's simple, it's blunt, and it's often quite on the nose, but I absolutely adore it. At the same time, I will be the first to admit that it is, simply put, bad movie. But it is a great bad movie. While director Paul Verhoeven had some high ideas about how the movie could be a satirization of fascism and of hypermilitarization, it really missed the mark on those counts. 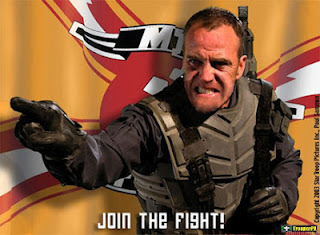 Instead, we ended up with some popcorn science fiction of the highest order, full of violence, catch phrases, and gore. Lots and lots of gore. The whole thing is cranked up to 11 from start to finish. The movie is absurd. And it revels in its absurdity (just look at those public service announcements throughout it!). Despite how ridiculous everything is, every single person in the movie plays it straight. This insane world has its own internal consistency that holds true from start to finish. And what a world it is. The movie is sprinkled with bits of dialogue, settings, and props that hint at a far wider and more complex world than we ever really get to see. The Federation and its war machine are intriguing and fascinating in a way that we never truly can understand. How did the world end up this way? Who is truly in control? And why was there such a well-developed industrial military complex in times of peace? These are only some of the questions that I can find myself asking after watching this movie. 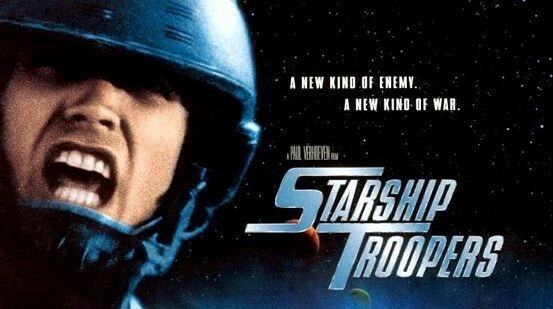 Starship Troopers is definitely a bad movie, but it's one hell of a bad movie. One of the best that I've ever had the pleasure of watching. It is filled to the brim with style. It is a living, breathing world that, while absurd, makes sense in its own strange way. It could have been better - probably a lot better - but I love it all nonetheless. Besides, sometimes you just need some testosterone-filled, senseless violence. And this movie has that in spades. So let's do this. Let's take it to those Bugs. Let's be the next heroes of the Federation. "Come on, you apes! Do you wanna live forever?!" This is an interesting one for me, because while I have read the original book, I've never watched the movie all the way through (though I've seen clips and snippets from it).